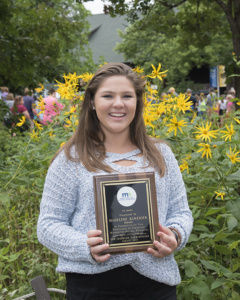 Madeline Kinziger from Duluth, Saint Louis County, received the 4-H award and Calyn Rieger from Dassel, Meeker County, received the Future Farmers of America (FFA) award during a ceremony Aug. 31 at the DNR stage at the Minnesota State Fair. The DNR Commissioner’s Youth Awards are given annually to an FFA student and 4-H member who have demonstrated initiative, leadership, creativity and achievement in conservation and wise use of natural and agricultural resources. This is the 27th year of the award program. Madeline Kinziger, 4-H award winner. Encouraged by her biology teacher to pursue a community-based learning project, Kinziger chose to build wood duck boxes and install them over wetlands at the North Star Academy in Duluth. Kinziger reached out to local science educators and DNR staff to learn more about the construction and installation of a wood duck box. Students at the North Star Academy will now be able to monitor duck usage of the boxes as part of their outdoor education program. After near extinction in the early 20th century due to over hunting and loss of suitable forest habitat, wood ducks have made a remarkable recovery. Part of this recovery is due to the efforts of individuals like Kinziger. She is the daughter of Brian and Aundrea Kinziger. Cayln Rieger, FFA award winner. Rieger has been working for the Conservation Corps program for three seasons, working as a crew member, a wilderness crew member and a Backcountry Leadership Program crew member. The Conservation Corps provided Rieger work experience that included trail repair and cleanup, invasive buckthorn removal, and erosion control and management. 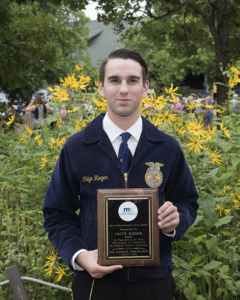 Rieger’s Conservation Corps experience, as well as his FFA activities and community involvement, has taught him how to take responsibility, work as a team member and to become a better leader. Rieger is currently enrolled at Ripon College in Ripon, Wisconsin with a strong interest in environmental studies, politics and government. He was joined at the ceremony by his father, James Rieger.